Amy is a hometown girl, born in West Allis. She has a younger brother and a younger sister. Grade school days were spent at St. Paul's-West Allis. She attended Martin Luther High School and then Concordia College-River Forest. Amy graduated with a degree in education, with an emphasis in science and math. Her student teaching experience was at St. Paul's in Mt. Prospect, Illinois. 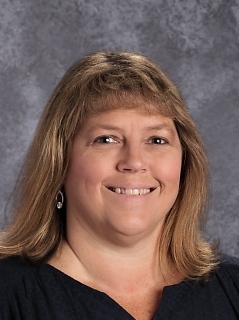 Amy's first teaching call was to LSA (the Lutheran School Association) in Decatur, IL where she taught a seventh grade home room, 7-8 science, a section of 7 math, and a section of 8 math. Amy ran the science fair for the school, and helped with the track team. After three years in Decatur, she received the call to teach at EGLS. Amy accepted the position as sixth grade homeroom teacher, and 6-8 science teacher. During these early years at EGL, Amy was approached by Perry Bresemann and the Elm Grove Police Department to start a DARE program at EGL. She was thrilled to agree, as she had knowledge of the program from her time in Decatur. DARE is still a part of EGL's programs today. In addition to being a DARE classroom teacher, Amy has worked with girls’ sports and cheerleading for many years. She has also been co-chair of the school fundraiser, done VBS, sung in choir, and played handbells and flute. In 1992, Amy married Jayson Weymier. The wedding was here at EGL, with many of her students attending the service. Their son, Andrew, was born in November, 1996. He is currently a senior at Milwaukee Lutheran HS. Hannah was born in October, 1999 at 24 weeks. Her health from her premature birth was touch and go for a while, but through the power of prayer and God's healing hand, she is now a freshman at Milwaukee Lutheran HS. To this day, Amy is so thankful to God for His grace and mercy during those early weeks and months after Hannah was born. Being a part of the EGL family was such a blessing during that time, and she feels blessed to be a part of this congregation. Amy remembers wanting to "grow up to be a teacher". When she was younger, her grandfather built a small roll-top desk for her to play school. She "taught" her brother, sister, and friends from the neighborhood. Middle school has always been Amy's favorite students to teach. They are capable, confident, and love being challenged. Teaching science gives Amy a way to share all of the wonder and power of God through His creation. She loves showing the students how perfectly God's design for everything is, whether it be cells, plants, symbiosis, or the periodic table. A favorite Bible verse of Amy: Jeremiah 29:11 "For I know the plans I have for you", declares the Lord, "plans to prosper you and not to harm you, plans to give you a hope and a future."